Today is Undiagnosed Children’s Day, a nationwide event aimed at increasing awareness of SWAN or Syndromes Without A Name (also known as an undiagnosed genetic condition). Around 6,000 disabled children are born every year with a condition so rare, doctors haven't seen or identified it before. Without a diagnosis, families can feel extremely isolated and they face an unknown future. There are so many families who need support and our 'Big Ambition' is that all families affected by a syndrome without a name get the support they need, when they need it. Claire Walton has a son with an undiagnosed medical condition. She's written SNJ's post for Undiagnosed Children's Day about how difficult it was for her to understand the implications of his disease being so rare that it doesn't have a name. It may come as a bit of a surprise for those who know me, that I didn't really accept that we were ‘official’ members of the undiagnosed club until nine months ago. Rowan had lots of labels, which I won't bore you with again, and life over the last almost seven years has been complicated, rough and downright terrifying at times. I wasn't expecting a ‘cure’ – that I accepted a long time ago, but I didn't expect this ‘no diagnosis’ thing to be an ongoing situation. I mean, he has lots of ‘symptoms’ and he has lots of ‘complexities’ and he has had a ridiculous amount of tests, and we are under the world-famous children's hospital along with many other specialists, and professionals. Logic says there is enough evidence, and enough professionals involved that SOMEONE would know what's going on, right? Wrong. We're in this ‘no diagnosis’ limbo for the foreseeable; it's not just while we're waiting for test results, it's not just while we're waiting for a referral to a new doctor. There is no medication, or diet change, or surgery that will fix all the problems, and there is no ‘eureka’ moment imminent. There is no ‘final piece’ of a puzzle that will complete the picture; we have lots of pieces from lots of puzzles, and we're trying to fit them all together somehow. You know when you go to the doctor with a lump ... and you go through the process of blood tests, and scans, and ultrasounds, and you're terrified the whole time, asking: ‘what is it?’, ‘what could it be?’ Imagine that, every ... single ... day. That anxiety of what tomorrow could bring. What if? What if? What if? With Rowan now almost seven, I think every day ‘what if?’ What if today is his last day? What if this opportunity never comes again? What if we never get a diagnosis? What if ... this is it? Those ‘what ifs’ never go away? This ‘undiagnosed’ situation isn't temporary. Our journey with Rowan has a beginning and a middle ... the end is pending. It's hard work, it's frustrating, it's lonely, stressful and demoralising, it's depressing at times, and it's scary. But ... it's not all bad. Rowan is Rowan, regardless of whether he has a diagnosis or not. It has taken me a long time to come to terms with the fact that being undiagnosed isn't a temporary stage, it's not just that we haven't ‘looked hard enough’, it's not that we are waiting for results. We've done the tests, some were pretty horrific, and some, as you may know, went horribly wrong. The results are in, they have been calculated and verified, and the verdict is in. UNDIAGNOSED. It was an adjustment and a lot to get my head and heart around. So, I have finally, officially, logically and emotionally accepted it, and have come out of the closet. We are HAPPY to be undiagnosed, and we are PROUD to be a part of a pretty amazing, unique, and diverse community that is SWAN UK – every single one of us different, yet every single one of us united. And from this acceptance, has come motivation. Never will we let an opportunity go astray and never will an opportunity to educate a person about being undiagnosed be missed. To you we may just be one undiagnosed family, but actually there are thousands of us. Friday 29 April 2016 is Undiagnosed Children's Day. This is a day where ‘we’ (members of SWAN UK) raise awareness for our children's situations. To try to raise a little bit of understanding as to why being ‘undiagnosed’ is important to us, and some of the additional challenges we face. All families who experience disability face challenges, many of which are similar, and yet some of which are unique to our community. We also like to raise the profile of SWAN UK so that other families out there can find us, and we can all stick together through the good times and the bad. Did you know 75% of parents, whose child doesn't have a diagnosis say that they feel isolated? I am one of those 75%! Just by networking with other families together, through social media or through local meet ups and coffee mornings, that figure should reduce. Why should we all care? Because every year 6,000 babies are born, and will have a disability that will be undiagnosed. In 2009 Rowan was one of those 6,000. It happened to me, it could happen to you, or someone else you know! It matters because Rowan matters. It matters because I matter. The 6,000 babies born every year matter. My role with SWAN UK involves raising awareness of our work and undiagnosed genetic conditions and I work closely with families to communicate their experiences as well as acting as the first point of contact for enquiries. I also enjoy organising events for SWAN UK families and managing SWAN UK’s social media accounts. I have a background in journalism, marketing and events and am passionate about giving people a voice and a platform to tell their stories. 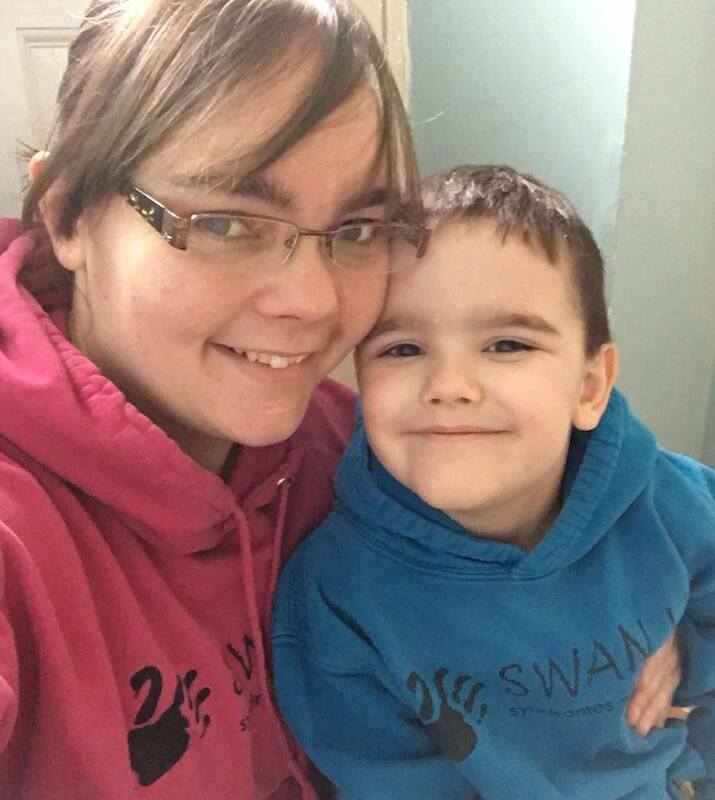 My role with SWAN UK involves raising awareness of our work and undiagnosed genetic conditions and I work closely with families to communicate their experiences as well as acting as the first point of contact for enquiries. I also enjoy organising events for SWAN UK families and managing SWAN UK’s social media accounts. I have a background in journalism, marketing and events and am passionate about giving people a voice and a platform to tell their stories. Work and the parent carer: a choice or a right? My #Undiagnosed Day video to say thanks to those who get care right.